Dinos have held a special place in my heart for a long time now. 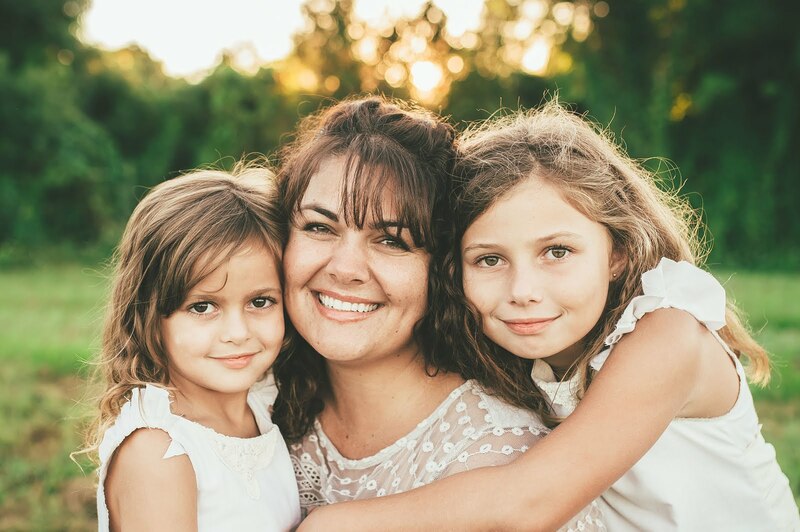 When Savanna was a toddler she gravitated towards all things dino... toys, TV shows and clothing. By the time she was 4 or 5 she could name dozens upon dozens of dinosaur species. We watched things like BBC's Prehistoric Planet and other dinosaur documentaries. Savanna still has a soft spot for her prehistoric creatures and her devotion has grown to nest inside me residually. When I heard about Nocturne Alchemy's Prehistoria Dinosaur Collection and learned it was meant to be a series of amber variations to layer with other fragrances, my willpower became extinct and I struck and fell upon a few like a ravenous Allosaurus. In the amber bottle, resins, tangy and sharp, rocky and smelling full of sun warmed desert stones, dust up into the senses. On the skin, the sun warmed desert stones morph into the more viscous and fluid heat of copals. They lie like dark sepia smudged shadows that lurk in inhabited caves and the valleys and crevices of a sacred body. Dusky and resinous, then soft and smooth with a touch of honeyed sweetness. This is a smoldering amber scent. 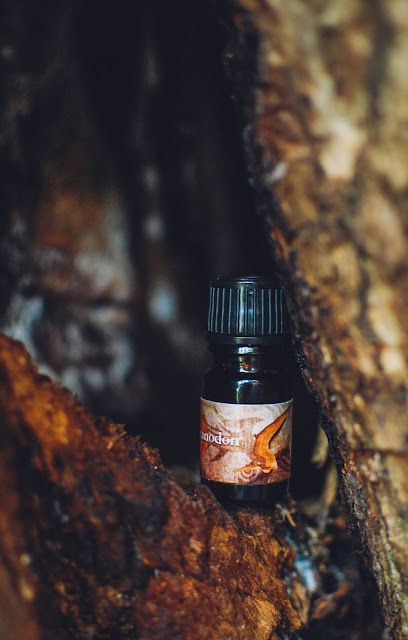 Rising from the glass, piquant sugared ginger and beachy teak swirl in an island mist of amber reins. On the skin, the same crystallized ginger blends in a matrix of fossilized amber. Dewy fragrant saplings of rosewood unfurl among the amber and fresh patchouli springs up amid the teak. This wears like an elegant and whimsical scent. An abandoned island plantation home oozing with mystery and beauty and overgrown with sweet tropical flowers and wild patchouli greenery. Beautiful to wear. 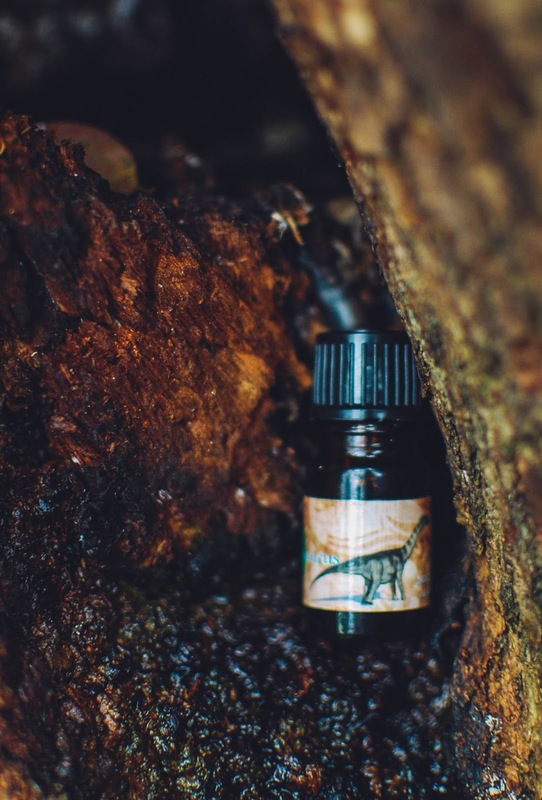 Flying from the vial, Pteranodon smells of crisp amber and bleached sandalwood, arid and almost herbal in its freshness. 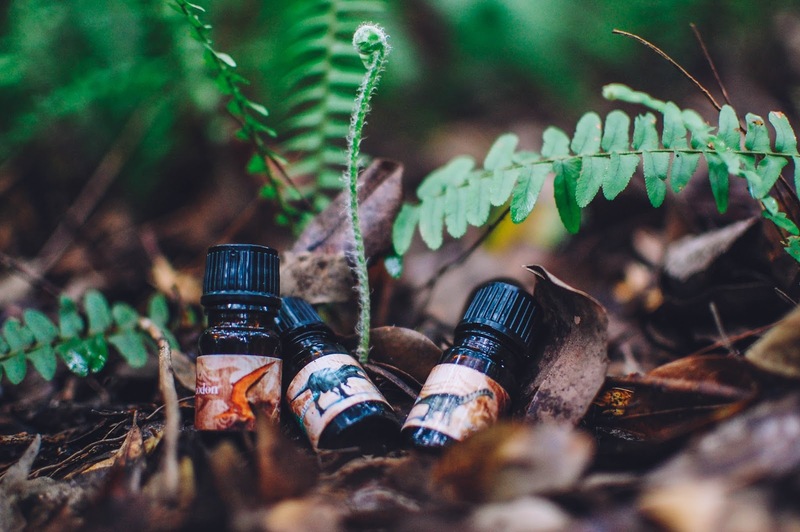 Once landed on the skin, the single drop of cacao beads on the flesh then sinks in and runs along the grain of the sandalwood creating lowlights while a golden amber gilds with highlights. It makes for a serene sandalwood. 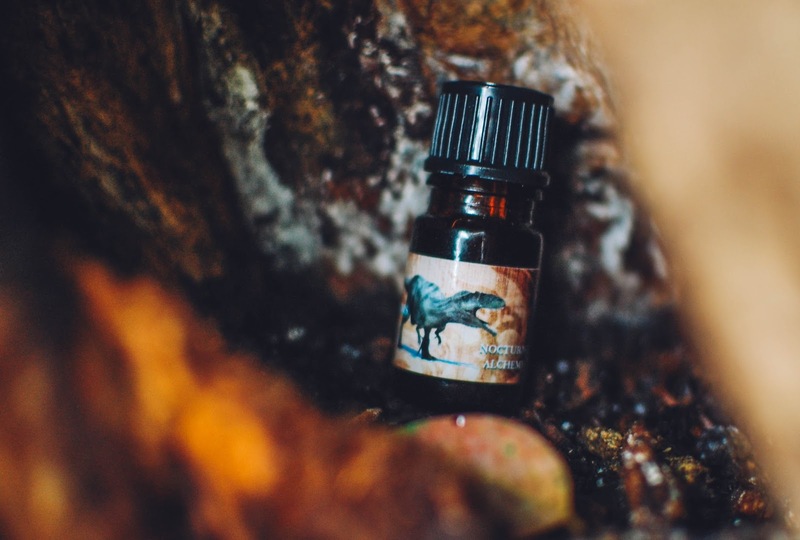 Then the wood turns a creamy and almost hazelnut tone, could be the cacao resurfacing, but the sandalwood reigns queen, regal and plush against the amber backdrop. A scent for sandalwood lovers, like myself. 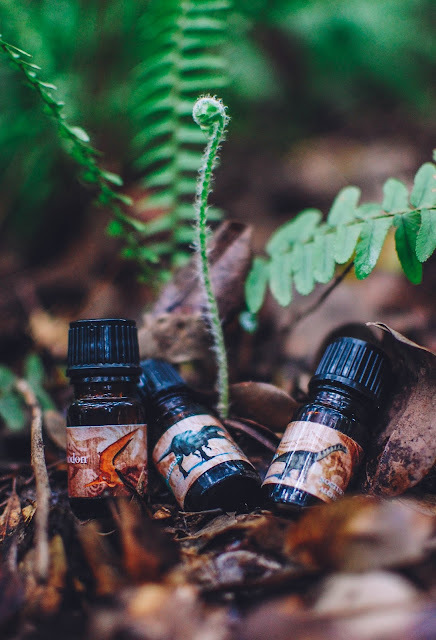 These dinos are light and lovely scents in their own right, but are truly meant to be layered with other Nocturne Alchemy perfume oils to create new and more complex scents that radiate refinement. I do have another dino on the way, Diplodocus, which I hear is stunning. It is a frankincense centric amber. And my daughter wants me to pick up Velociraptor... because if I don't it will be a crime against her current favorite dinosaur. I wanted to get these reviews out as soon as I could because the Prehistoria Collection will be retiring September 1st. Get them before they disappear forever into the ether of the past. Oh! And the first Halloween release will be that day as well, so bring some spooky things home along with a dino or two. Were you ever a dinosaur fan as a kid (or older!)? Which dino is your favorite? I was always partial to Ankylosaurus. What a cute blundering beast of a fellow. Do amber scents strike your fancy? Do you layer perfumes? Do tell! Oh my, I want all of these! And your photo staging is perfect :) Fun dino-aside: my brother did his masters in entomology at Oregon State and worked with George Poinar Jr., the guy who came up with the idea of extracting DNA from specimens trapped in amber. I am digging these scaly fellas. They are really fun to play with. How cool!! I cannot even begin to imagine how much I would geek around around that professor. I love Michael Crichton books and I took a few entomology classes in university too. In fact, it is kinda funny your brother has a Masters in entomology, my sister does too. She just moved out to Houston to work for a pesticide company. Fascinating field. Oh neat! Chris is now working for Oregon's state ag department tracking and controlling invasive species. That is cool. And that will certainly keep him busy. Invasive species are always a huge deal. Especially for agriculture.